Hi friends! This post's a little long and has some more personal content, so grab a cup of tea and get cozy. I honestly thought that my battle with disordered eating and body dysmorphia was mostly over. After moving to New York, I was eating fairly regular meals, albeit sometimes small; I began to focus more on practicing self-love, which is what this blog is mostly about; I allowed myself to eat food that I wanted to eat, including sweets and cake and gummy bears. I drew a picture of myself in my underwear and taped it next to my mirror so I could remind myself that at least in charcoal, I was beautiful. A portion of that self-portrait, cropped because I am still uncomfortable with showing my entire body. Also, please ignore my inability to draw my small fingers with large charcoal pencils. I got a physical check-up on Monday, April 30th, the first one in my recent memory. I've always avoided going to a physical, partially because they check my blood pressure and other necessities at the gynecologist, mostly because I will always try to get out of going to the doctor if I can. The last time I had one was probably early-college. Perhaps I forgot how uncomfortable doctor's offices make me. Don't get me wrong - the doctor I saw was kind, friendly, and definitely put me at ease. We chatted easily about the things that was bothering me - my eczema, my joints that crack loudly and often - and the weather. She had lovely bedside manner and I definitely plan on going back to her. But there is one thing at the doctor's office that I always dread: the scale. I don't really remember the last time I weighed myself. A friend in high school had a scale, and I would often weigh myself there; but I never went out of my way to purchase one for myself, knowing that the number - that one, stupid little number - could completely destroy my self-image despite knowing logically and intellectually that it really meant nothing. And I'm very much aware that I am a fairly small person, especially in America. I'm very much aware that my weight falls easily in a normal and healthy range and that I really honestly should have nothing to complain about. I know that I basically won the genetic lottery for health - nearly no concerning family medical history, perfect vision, a naturally small frame, a metabolism that allows me to get by with basically no exercise. How is it that I can know all of this, and yet still become so upset over one three digit number? And so, the verdict was in: since the last time I weighed myself, likely 5 or so years ago, I had gained nearly 20 pounds. The stray thoughts about that extra little pudge that sometimes came up when I was looking at my body in the mirror suddenly all came rushing back. As I walked from the doctor's office near Central Park to my SO's office near Penn Station, I tried to convince myself that I thought it was okay, that I was still technically a normal, healthy weight for my height, but it was an internal battle that I was losing fast. By the time I saw my SO less than half an hour later, I knew I was spiraling. I've always been a little neurotic. I like to take control of the things I can - and for a while, in high school and some of college, starving myself was a way I could control the way my body looked. When my eating became something I could no longer control - due to stresses in college and extremely painful sores that inhibited my ability to eat - it became something I fought to gain back control of. Today, I channel that neuroticism into my creativity. I have extensive google spreadsheets, which I use to track things from Etsy sales to my daily expenses. I use a bullet journal, where I obsessively track my my own personal data on paper and I journal to help heal any issues I may have. 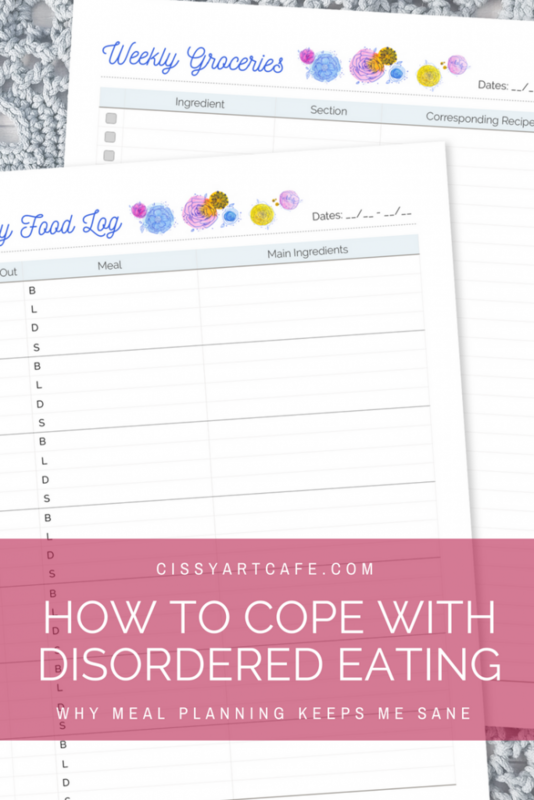 I write this blog, to help keep myself more accountable of the things I'm creating but also as a personal diary so I know when I begin to lose control of my mental health. I channel all of my energy into my artwork, into daily challenges that take up my time so I don't have time to think about harmful things. I listen to podcasts and I craft and I read on the train. I freelance to take up the rest of the time. I like to keep busy. I've turned some of my favorite trackers into printables, but I also find a lot of joy and beauty in regular grid-form trackers. Basically, the more things I can track and learn from my personal data, the better. 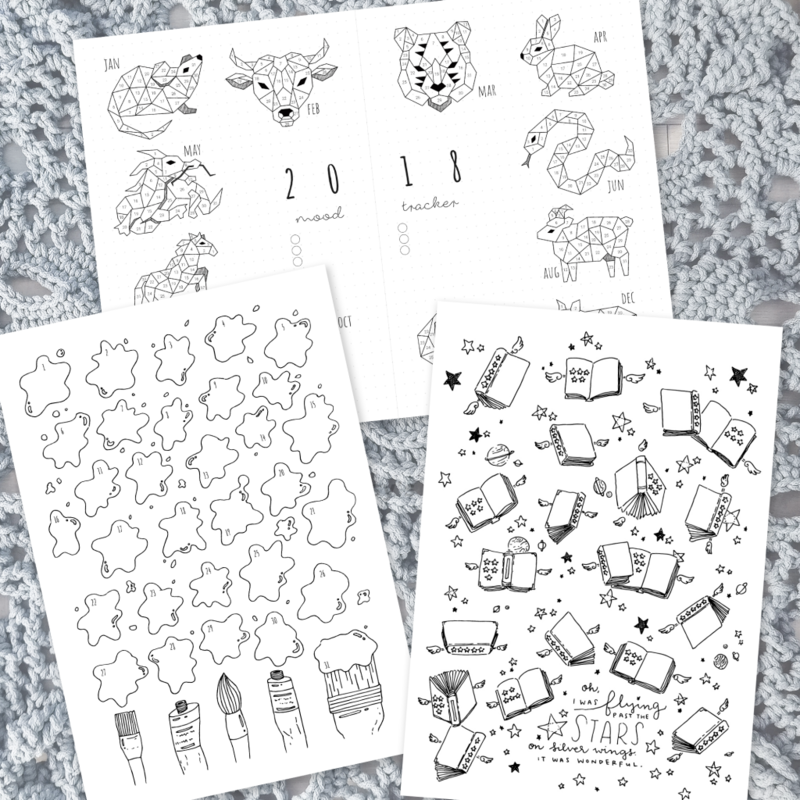 Find my geometric animal year-long mood tracker here, my whimsical reading tracker here, and my art splatter personal growth tracker here. I thought I didn't need to control my eating habits anymore. But one of the first things I noticed after I began to spiral was that my appetite had vanished, and I knew almost immediately that I could easily slip back into old habits. One of my first thought, actually, was wondering if I could get away with skipping meals again. I also knew that it was a bad idea. I knew that not eating meant my hair would fall out, that my face would become pale, that I would become lethargic just as the weather was finally beginning to warm. More importantly, I think, I knew that it would cause my people - my SO, my roommate, my friends, my family - to worry. So I found a way to take control over my body again, this time in a healthier way: meal tracking and planning. My quick-and-dirty meal tracker, made in a few minutes on Google Sheets. Am I eating at regular times? Am I eating all of my meals? Am I eating food cooked by myself (or my boyfriend) with groceries from a store, or am I eating food from a restaurant? I care about this because generally speaking, home-cooked food is substantially healthier than restaurant food. What am I eating? If I'm using a specific recipe, I'm linking it so I can reference it in the future. Am I eating the rainbow? This is kind of a cliché that people often teach children (raise your hand if you had the I Can Eat The Rainbow book as a kid) but, in my very not-a-doctor-or-a-nutritionist opinion, is still pretty good advice. On a separate tab, I have a few recipes I've researched for the week (I've been loving this blog, Skinny Taste) and the ingredients listed out as a checklist, which I then arrange into the sections I go through sequentially when I'm in my grocery store. Tracking every single piece of food I eat can be a little tedious, but thanks to the magic of Google Sheets and the cloud, I have this with me on my phone so it's not actually too much trouble. While cutting out sugary snacks in March really helped with cutting down snacking in general, tracking helps me with my last vice: pretzels! I'm much more tempted to eat fruit as snacks now because I like making my ingredients list as rainbow as it can be. Speaking of which, I can tell when I'm eating healthy because of the ingredient colors! I don't seem to have an issue with eating my greens, and when I eat a meal that's lacking in a certain color I can compensate for it in my next meal. My portion sizes have become smaller, which is how I'm dealing with my extra unwanted weight. I'm planning on actually attempting to incorporate more exercising in my lifestyle (even though I really kind of despise it), but I wanted to get a handle on my eating crisis first. Since my hunger reflexes are not really functional right now, eating smaller meals isn't too hard. The time tracking helps me remember to actually eat, or at least grab a snack. I've attempted meal tracking a few times in my bullet journal before, but it could never really stick. While I love pen and paper, I think the accessibility of this method works a lot better for this specific situation! 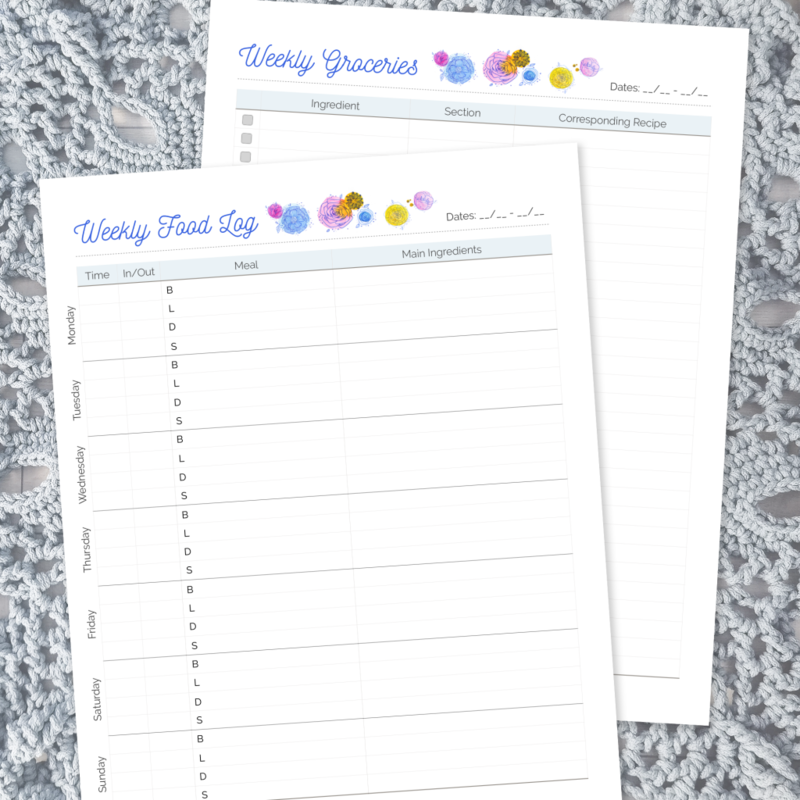 I've created a FREE printable version of this tracking system for you if you'd like to join me in this meal tracking journey. Psst. You can get the password to my Freebie Library by signing up for my monthly newsletter! And, in case you were wondering, I've already selected this week's recipes. I'll be making this delicious-looking Bruschetta Chicken and avocado toast for my lunches and dinners, and I've made a really simple quiche for my breakfast! I like to use Pinterest for all of my meal planning and recipe searching. Since this meal planning and tracking thing is all new to me, I would love to hear any and all advice you have to give! Let me know what worked for you and what didn't, and I'd love for you to share some of your favorite healthy recipes with me. Also, give me advice on how to make exercise a real habit! That's definitely an area I'm really lacking in.